Speedster Kagiso Rabada led a clinical bowling display with a four-wicket haul as Delhi Capitals beat Sunrisers Hyderabad by 39 runs under dramatic conditions in their IPL match in Hyderabad on Sunday. With the win, the Delhi Capitals jumped to second spot on the IPL points table with 10 points from eight matches while the Sunrisers are at the sixth spot after their third consecutive loss. At the halfway stage, the Sunrisers were 73 for 1 with 83 more runs needed for a win and they were on track. But the dismissal of captain Kane Williamson (3) off the bowling of Paul in the 12th over was the beginning of the pressure that began to pile on the Sunrisers. Warner was still there, but the Delhi bowlers gave him little chance to open up his arms on a sluggish pitch. Bhui's dismissal in the 16th over piled on further pressure on the Sunrisers. The asking rate climbed up to 13 an over at the end of 16th over and the home side wilted under pressure, with Warner finally falling in the 17th over bowled by Rabada as the batsman hit straight to the hands of captain Shreyas Iyer. Rabada got rid of Vijay Shankar (1) in the next delivery and with it the game was as good as over in favour of Delhi Capitals. It was then the turn of Morris to take three wickets in the 18th over before Rabada ended the Sunrisers's run chase with two wickets in consecutive deliveries. The 21-year-old bowler took the wickets of openers Prithvi Shaw (4) and Shikhar Dhawan (7) as well as that of the dangerous Rishabh Pant (23) while conceding 30 runs from his four overs. 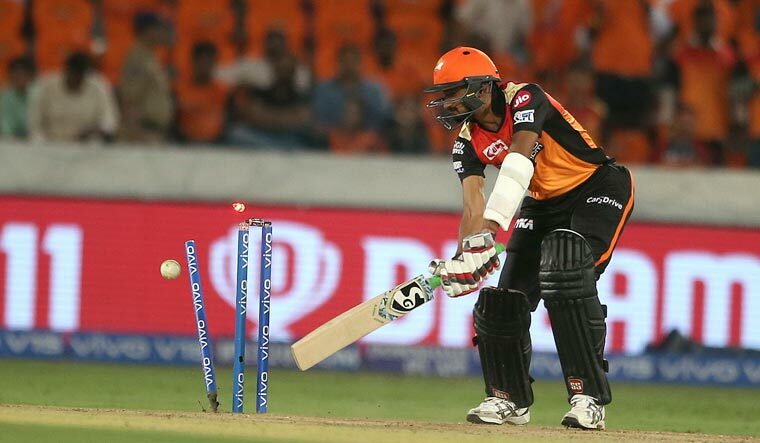 Senior pacer Bhuvneshwar Kumar returned with figures of 2/33 while leg-spinner Rashid Khan and Abhishek Sharma took a wicket apiece as the Sunrisers's bowlers made it difficult for Delhi batsmen to score runs.